Ginny, or "Nanie" as she was known as by her grandchildren and great-grandchildren died Sunday, December 3, 2017 at her home in Cary, North Carolina; she was 88 years old. She died peacefully surrounded by her family. Ginny was born in Boston, Massachusetts to the late Milton Sunbury and Margaret Sunbury n�e Vondell, but lived most of her life in New Jersey. She worked in administration at Pechter's bakery for many years before retiring. Ginny loved to travel and she enjoyed quick gambling trips whenever possible. Her greatest joy, however, was her family. Nanie loved her grandkids and great-grandkids and they loved her; she especially enjoyed watching their extracurricular activities. Ginny was preceded in death by her parents, her husband, Columbus DeJohn, her sons, Robert and Thomas DeJohn, her son-in-law Byron Best, granddaughter Jamie Lee DeJohn, her brothers William and Sonny Sunbury, her sisters: Dorothy Ackerson, Margaret Farrell, and Maryann Carr. 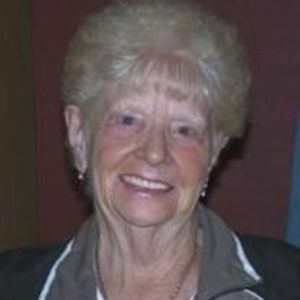 Ginny is survived by her son, James DeJohn; daughter, Linda Best; grandchildren: Tina Sanchez and husband, Eric; Dana Geris and husband, Nick; Jeneane Morris and husband, Conor; Jordan DeJohn; Lisa Wall and husband, Mike; James DeJohn and wife, Megan; great-grandchildren: Vincent, Dominic, and Sophia Varano; Peter and Ryan Geris; Christian and Grace Sanchez; Tyler and Mikenzie Grasso; Kayla Sawicki; Vincent and Alexa Wall; and sister, Patricia Morella and husband, Vinny . She is also survived by granddogs Scarlet and Caesar as well as many nieces and nephews. Ginny also had a number of special relationships with people including Mary DeJohn, Luann DeJohn, Ralph Varano, and Sheela Williams. The family will receive friends 5-7 PM on Wednesday, December 6, 2017 at Apex Funeral Home, 550 W. Williams St, Apex, NC 27502. A prayer service will be held at 7pm in the Apex Funeral Home Chapel. A visitation will be held 10 AM-12 PM on Friday, December 8, 2017 at Wilfred, Armitage and Wiggins Funeral Home, 596 Belgrove Drive, Kearny, New Jersey 07032 with burial to follow at Holy Cross Cemetery in North Arlington, New Jersey.